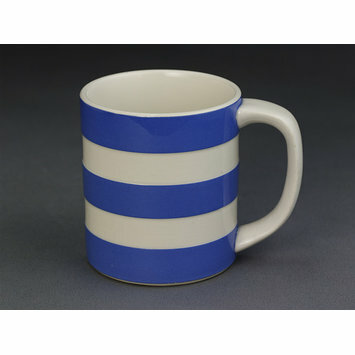 Mug, straight-sided, with white and blue horizontal stripes outside, white inside and white handle. By the 1930s the kitchen was developing as a room in which the family spent time. It became a social space, not just a separate, purely functional room. In middle class households servants and housemaids were less common, and a new design consciousness and consumer demand for pleasing kitchenware form the cooking range to storage jars was established. T.G. Green hit a particular market with the Cornish Kitchenware range. Retailed through Woolworths in the early 1930s as standard ware in a wide range of matching kitchen vessels, it has been in continual production ever since, with occasional design updates (like the post-war mug). The ware consisted mainly of breakfast ware (egg cups, milk jugs, cereal bowls and mugs) or storage jars which gave a cottagey display of cooking ingredients and was intended for everyday use. It is probable that middle class householders would have had a more refined bone china service for use at dinner, a more formal meal which was eaten in the dining room rather than the kitchen. It is interesting that in the 1920s similar ware was being produced in Germany, the German title evoking an American influence. Whether Wiener Werkbund or Early American in influence to the British eye Cornish Kitchenware has always been associated with the nostalgic ideal of the English Cottage. 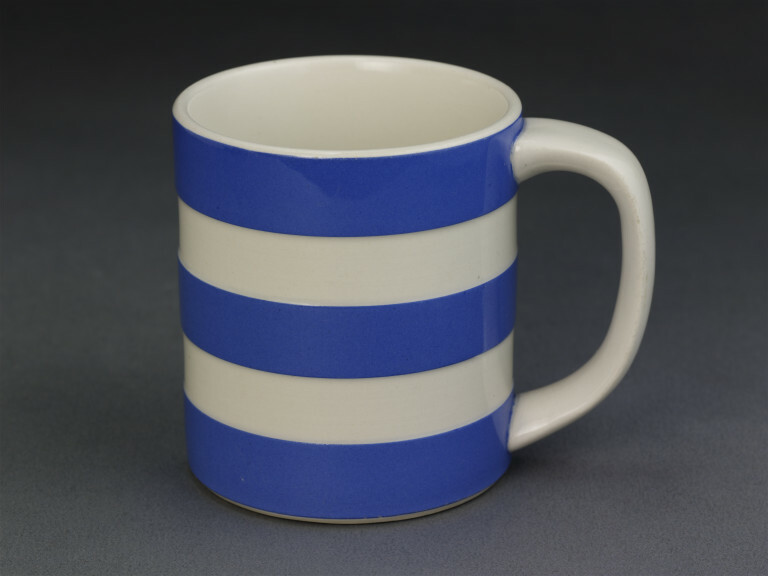 'Cornish Kitchenware' mug, glazed earthenware, manufactued by T.G. Green & Co. Ltd, re-styled by Judith Onions, England, after 1945.